At the media meet of Dhilukku Dhuddu -2, comedian turned hero Santhanam said: “The first part was a big hit mainly because of the hilarious climax comedy episode so for the sequel too, we have concentrated more on the comedy episodes”. When asked why he has become silent these days, the actor said: “I’ve decided to be calm and not talk much about my films before the release. I want the content to speak on its own”. Talking about his pending films, “I have finished shooting for all my movies. 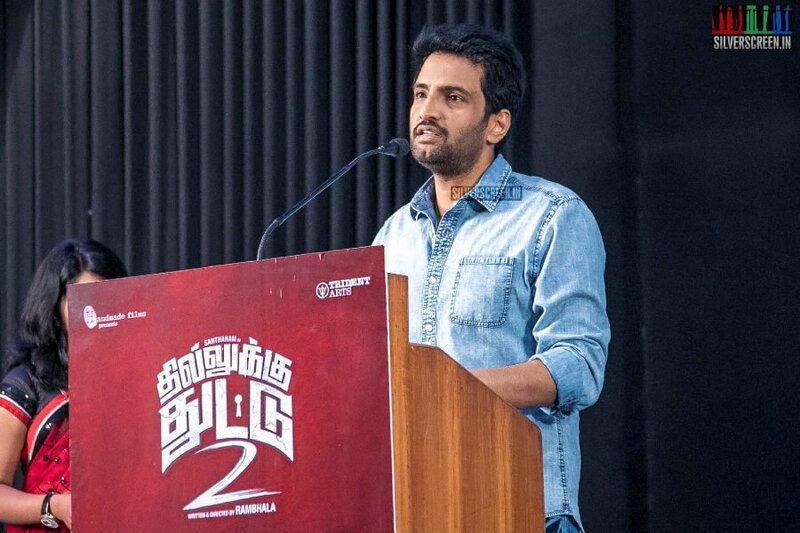 These days, making films have become easy but releasing it has become a herculean task”, said Santhanam. Santhanam also said that if he gets bored by heroic films, he will become a filmmaker. “If I become a filmmaker someday, would like to direct Arya”, said Santhanam but he refused to comment about Arya's marriage reports. Directed by Rambhala who made the first part, Dhillukku Dhuddu 2 is all set to release on February 7.